A breezy day was spent digging through more demolition rubble in the vicinity of the site of the outside toilet. Pieces of iron in vicinity of outside toilet; crumbly layer of mortar top right; photo slightly enhanced. A piece of iron had been found sticking up out of the ground on our previous dig day, in the vicinity of the outside toilet. 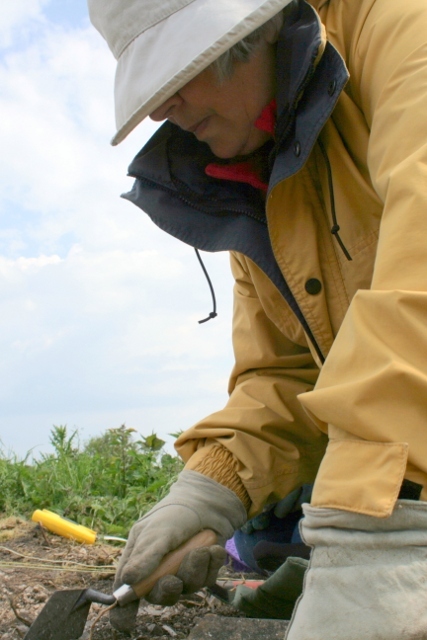 A 50cm wide sondage was therefore started, to excavate the fill in which it was embedded. 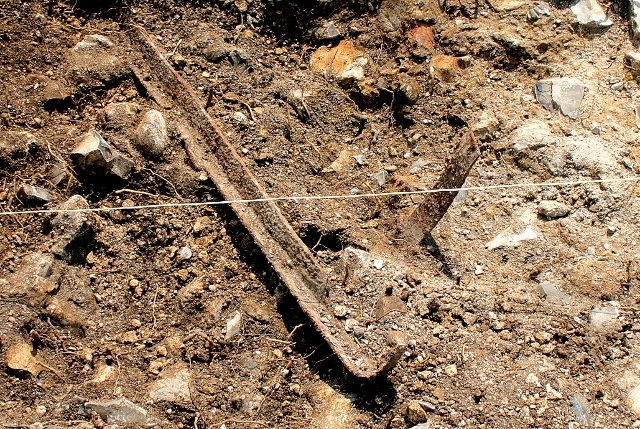 This revealed a second, larger piece of angle iron, lying approximately horizontally. Its context was unexpectedly found to be that of more demolition fill. However, it was of a different nature to that which overlaid it. Slate roof fragments were smaller and less frequent; there was an increased amount of crumbly, yellowish, mortar, especially in the vicinity of the nearby flint wall; and though the site is drying out and it was a windy day, it was much more dusty than expected. I therefore think it is likely to have originated from WW2 ordnance caused demolition rather than the bulldozer – the latter would have been the source of the upper layer of demolition rubble. 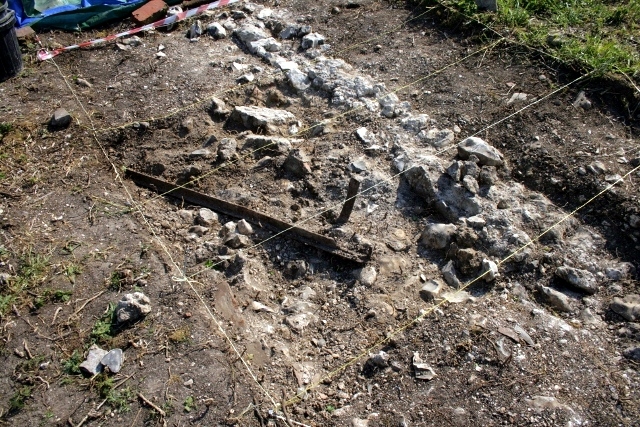 The sondage was extended a further metre to enable the length of angle iron to be fully excavated. 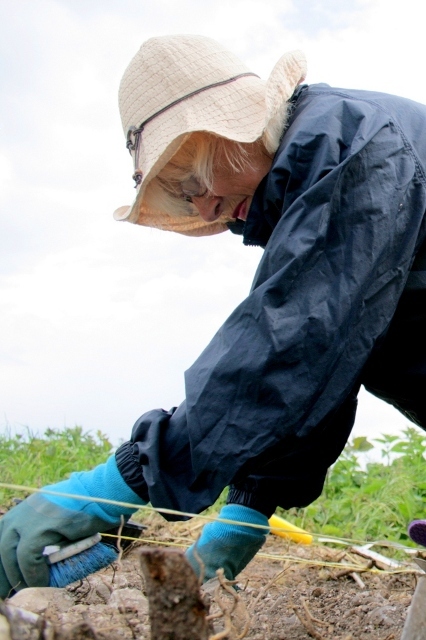 It was found to be about a metre long, and was such as might have been used as a post. It is very similar to the remains of an in-situ iron post right in the south-east corner of the garden, where an Ordnance Survey map showed a fence line once butted onto it, at or shortly before the time of Oscar Selbach’s ownership in the 1920’s. Further evidence that this was fill from artillery damage is that there is a piece of metal sticking up vertically though this fill which would otherwise have been flattened by the later bulldozer. 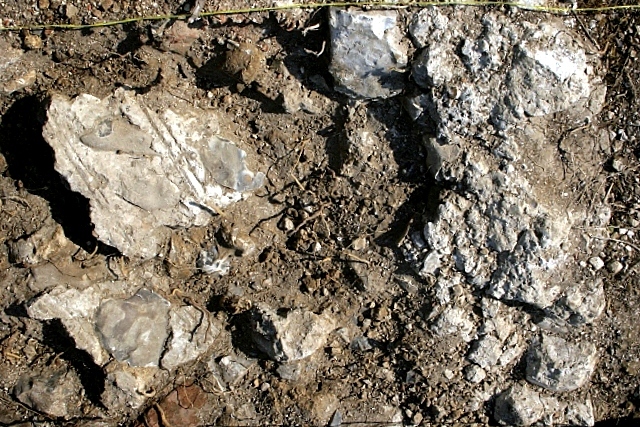 Artillery damage in vicinity of toilet; note intact fragments of demolished flint wall at far end of sondage; photo taken looking south. Next to it, some intact pieces of collapsed wall showed the characteristic horizontal lines inscribed in the mortar which divided each of the courses of flints, which are to be seen in situ elsewhere on the site. It is likely that if the damage caused was from one or more artillery shells hitting the west side of this wall – which divided farmyard from garden. 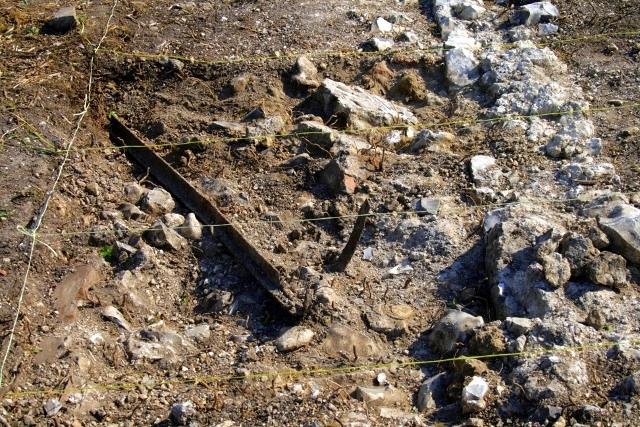 The most likely location of the field guns which caused this damage to the farmyard side of the wall, would therefore be in the direction of Stanmer Park, about three miles away. Smaller finds included more nails, fragments of glass bottle, two halves of a small terracotta roof tile, and the hollow tip of a once live bullet.